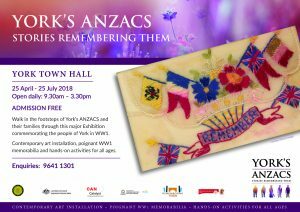 A big thank you to the staff and volunteers at the York Residency Museum in Western Australia for their vision to stage the ‘YORK’S ANZACS – Stories Remembering Them’ exhibition in the York Town Hall which opens on ANZAC Day. Janet and I are very grateful to Carol Littlefair, Arts & Cultural Heritage Officer, Katie Benfield, Curator, for their dedication and passion together with the volunteers at the YRM who have also enthusiastically given their valuable time – Heather Harvey, Principal Researcher, Cathy, Betty, Kathy, Michael, Kevin, Cindy and Julie. Likewise, we wish to thank the hundreds of people in the community who played their part. We are sorry we cannot be with you on ANZAC Day to thank you all personally. We would like to think Uncle Jim and the other 99 York servicemen represented in the exhibition are looking down on everyone with smiles on their faces. Lest We Forget. Wishing you all a fruitful exhibition. We hope it will create a huge amount of interest.